Starting a blog from scratch is not easy. You need to decide a good domain name, setting up the hosting service, installing WordPress and, most of all, producing constantly high-quality content for your audience! And of course, monetizing the website and making money with it is really a challenge! What if you had a strong motivation to start from scratch a new project to participate to an awesome contest? 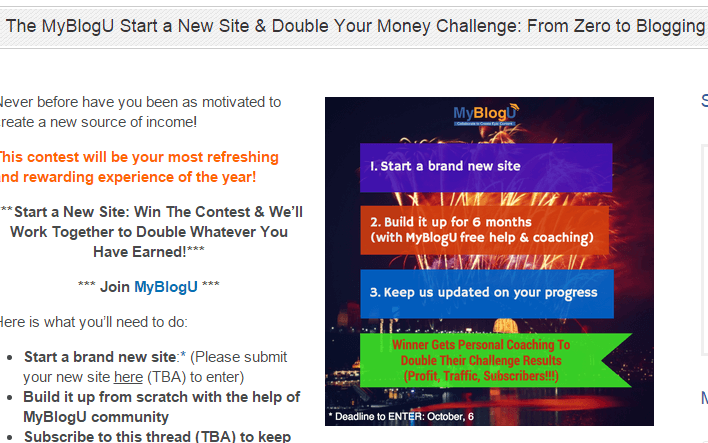 Well, keep reading, because MyBlogU just organized a fantastic challenge you want to be in! Follow the contest and use #MBUstorm hashtag to tweet your results and create more buzz! Share your site stats to check if you win the big prize! Please consider that the winner(s) will be not chosen from a jury, but determined based on real data of your website. In other words, your monthly traffic, your email list subscribers and conversions and your revenue (if you will reach any). Plus, your MyBlogU Rank points. The final outstanding reward will be a special personal training and coaching program with Ann Smarty herself (and the team)! They are going to help you working on your project and website in order to double your data, included the profits. Of course there are going to be many more prizes from partners, so be sure to follow the MyBlogU blog for the incoming news! So if you want to add an additional asset to your portfolio, be sure to start take part to this exciting project! This is indeed a great news! will be benefited by this. I am here via AhaNOW ABC Community. Where you shared this notification. Are you going to participate? thnaks for reading this exciting news. Hope you are going to participate! This is awesome! At least, its a long time I get to see a giveaway that demands real time practicality. It would be exciting to participate in this challenge as it will help one grow more with experience in blog creation! Its a good one from MYBlogU and I wish the best for participants! I’m going to be in! I had an awesome niche site project since a couple of months already, and this contest came handy!!! I look forward to seeing you there too! Very good opportunity for those especially who want to test their blogging skills and do the objective analysis. Such contest really promote the blogging talent of those who work in their field professionally. Thanks a lot for sharing and letting many to participate in it. Have a nice weekend ahead. yes, it is a great opportunity. I hope you are going to participate too! You can take chance to create another online asset to add to your portfolio! Thanks for the info Erik. When is the game starting? – remember to show your site data and statistics within April, 5th (end of games). Hope you are going to be in! I saw this update at MyBlogU yesterday and man, its very awesome. Yes, starting a blog and making a profitable one is never easy but with that kind of challenge, the whole process will be very fun and lively. I’m actually considering to join the contest and even if i didn’t win, it will enable me to take action and to also learn lots of new things along the way. and MyBlogU contest is the perfect occasion to boost the chances of success of my idea! Wow, this is popping up all over the internet, I must travel in small circles. I’m still trying to find focus on my existing websites. But am considering having a crack at this comp. It’ll take me a few weeks to get my head around a new blog. You should give it a go! One more online asset to add to your portfolio. And with the help of MyblogU team, it’s likely your project is going to rock. Thanks for visiting, and best of wishes! be sure to follow the rules and remember to submit your project to MyBlogU, before to start working on it. Good to see you on board! Its indeed a wonderful opportunity for all bloggers. Though I am busy with ny work and other projects I would like to give a try. Thanks for sharing this update. Thanks for checking this out, Umapathy. I’m already working on my new project. Are you going to participate, Mandip? Fall in love with your site! A bunch of thanks to you! Thanks for the kind words, Sanjay. Hope you keep following for more awesome content. Which type of blogs are success quickly? I guess you need to choose the topic of your blog depending on your passions, not thinking about what makes the most money. This sounded like an amazing opportunity for people really interested in blogging for a career. Building a blog from scratch can be challenging, but its possible to build a nice amount of traffic within three months if you know how to rank keywords in search engines. It can be very challenging, but with the right tools, you can make it happen. I seen guy named Pat Flynn’s video on how he ranked a website on the first page of google within a short time. It was awesome. that was indeed a great opportunity to start a blog from scratch and get help from the MyBlogU community. Shame you did not participate. Thanks for taking the time to read the post and leave your comment.